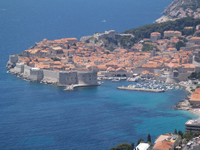 The main attraction of Old Town Dubrovnik (the City) apart from its old monasteries and beautiful palaces are the ancient City walls with its intricate and complex system of forts, bastions, casemates, towers and detached forts. Dubrovnik City walls are the most important feature of Dubrovnik and a world renowned iconic symbol of the white stone beauty, therefore the main reason why Dubrovnik is now known as the Pearl of the Adriatic. 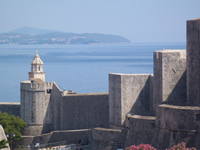 The characteristic appearance of Dubrovnik is unmistakable as no other city in the world has retained their medieval walls so perfectly as was the case of Dubrovnik and that is why Dubrovnik is included in the World Heritage List from UNESCO as far back as 1970. 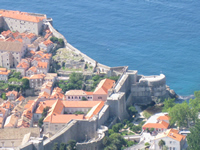 Dubrovnik City walls run uninterrupted for 1940 meters (6365 feet) encircling the City. 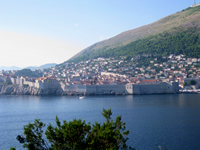 The City of Dubrovnik is completely surrounded with defensive walls and forts, including the Old Port. The walls were built systematically throughout history especially in difficult times when permanent danger of foreign attacks lured over the City and the Dubrovnik Republic, and the walls have been preserved to the present day and are still functional, not only because of the proficiency of their skillful builders, diligence and care of the Dubrovnik citizens who maintained them and built upon them as necessary, but also because of the splendid ability of the skilful Dubrovnik diplomacy who was able to obviate and avert threats posed by rivals and enemies to the Republic. The history of the fortifications goes back to the early middle Ages. No doubt the earliest urban settlement upon the islet of Laus was protected by walls. The fact that the city was able to resist the Saracens who besieged the city for 15 months in the 9th century means that already in that time the City was well fortified. The original Roman-Greek city core first spread over the uninhabited eastern part of the Laus islet. The eastern section was included within the defence walls in the 9th and 10th century. 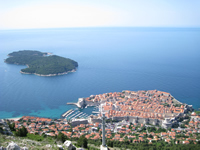 When the sea channel which separated the City from mainland was filled with earth in 11th century, Dubrovnik as we know today was formed in merger with originally Croatian settlement on land and soon a single wall was built around the area of the present-day city core. The whole city was enclosed with walls in the 13th century, except for the Dominican monastery, which came under the City wall complex only in the 14th century. The average thickness of the wall was 1.5 meters (5 feet), and it was built of stone and lime. To increase the strength of the walls and reinforce defensive position, 15 square forts were built in the 14th century. Extensive work was done on the walls towards the close of the 14th century, at the time of the final liberation from the Venetian supremacy. The design of the walls derives from the 14th century, while the definite shape was fixed in the period which is, not without reason, referred to as the Golden Age of Dubrovnik, from the fall of Constantinople in 1453 until the devastating earthquake of 1667. The main wall on the land side is 4 to 6 meters (13-20 feet) thick, but narrower on the side facing the sea 1.5 to 3 meters (5-10 feet) thick. Its height reaches 25 meters (83 feet) in some places. The wall on the land side is protected by an additional scarp wall as a defence against artillery fire. The irregular quadrilateral formed by the walls is protected at four prominent points by strong forts. The strong round Tower Minčeta is to the north, the port is protected by the detached Fortress Revelin in the east and by the big complex of the Fortress of Saint John in the south-east. The western entrance to the city is protected by the strong and beautiful Bokar fortress. The western end of the city is also protected from danger from the sea and land by powerful detached Fortress Lovrijenac. In addition to these strong and prominent fortifications, the city walls are protected additionally with 2 round towers, 12 quadrilateral forts, 5 bastions and 2 corner towers, while the scarp wall is flanked by one large and 9 small semicircular bastions. 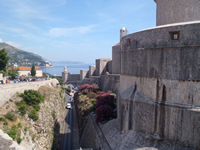 There are three entrances to Dubrovnik City walls. First entrance is located on the western side of the City at the very end of Placa (Stradun) street just across the Big Onfrio's fountain next to the Church of Holy Savior, to the left. The second entrance is located at the eastern part of the City close to the inner Ploce Gate and the third entrance to the City walls is located at the back side of St. John Fortress and the entrance to the Maritime museum. This third entrance is a bit tricky to find as you need to go behind Dubrovnik Cathedral to the south, climb the small staircase and turn left into a vaulted street.